Let me begin with the fact that I know almost nothing about hunting. So almost all of the information below comes from a few friends of ours who are hunters and hunt here in Germany. As you might expect, there's a lot of rules and regulation to hunting here and because of that it's a very interesting subject even for a non-hunter like me. If you’ve ever driven in Germany, whether on the autobahn or country roads, you’ve seen these wooden, stilted structures out in the farmer’s fields. They look like some kind of hunting blind and that’s exactly what they are. They're called a Hochsitz, high seat. The story behind them and the regulations that govern their use is quite interesting. German Hochsitz (High Seat) hunting blind. All land outside the cities, towns and villages in Germany is controlled by the local Waldmeister, Forest Master, which most Americans refer to simply as the Forest Meister, a German, federal employee. A farmer or land holder may own a property but the Forest Meister controls the hunting and wildlife conservation rights to that property. The Forest Meister leases those hunting rights to a Jagdpächter (game tenant), also called a Revier (pronounced, ra-fēr) Owner. So if a farmer wishes to hunt on his own property, he must obtain the hunting lease to his own land and become the Revier Owner of his land. Along with the rights to hunt a property, a Revier Owner is expected to control the population of deer, wild boar etc. by taking a minimum number of animals per year. The Forest Meister establishes those numbers and monitors each Revier Owner’s progress. Should a herd of wild boar enter a farmer’s property and tear up one of his crops he makes a claim with the Forest Meister for compensation. After evaluation of his claim, if warranted, the farmer will be reimbursed by the German government. Because of this process, it’s important to the Forest Meister that his Revier Owners adhere to their contract and control the population of the various wildlife that inhabit the German countryside. That’s where these hunting blinds come into play. As mentioned, they're called Hochsitz, High Seat. The Revier Owner constructs these hunting blinds. Some are quite sturdy and provide good protection from rain and wind, others are just a ladder with a seating ledge at the top. Apparently the Revier Owner can place the blind pretty much wherever they choose because you’ll often see them in the middle of a field which requires the farmer to plow, plant and harvest around the structure. These hunting blinds are used for all types of game, deer, wild pigs, fox and birds. Jeff standing on the ladder to a Hochsitz (High Seat), a German hunting blind. "Hunting structure. Entry forbidden under punishment. Game tenant." Speaking of Americans hunting here in Germany, service members here have to take numerous classes and prove their knowledge of German hunting rules and their shooting proficiency before they’re allowed to hunt here. Once all that’s done, which can take about six months, they have to find a Revier Owner who will allow them to hunt on their leased land. Even after that they must prove their skills over a period of time. Until that probationary period is complete they are not allowed to keep any game they shoot, all of it being turned over to a local government office who will distribute whatever meat might be available. All animals shot in Germany, whether kept by the hunter or not, must have certain organs turned over to a government office who will test them to ensure they are absent of any toxins or radiation poisoning. Another interesting thing about a Jagdpächter or Revier Owner is there are two types of leases; low game and high game. Low game is for small deer, wild pigs and smaller. High game is catagorized as red tail deer and elk. Some Revier Owner's may lease a particular piece of land because they want to nurture a herd of large deer so that at some point in the future he may have a spectacular trophy buck. In that case, he may want to lease the hunting rights of that property for ten years which can cost as much as 10,000 Euros. Bringing in your own guns to hunt in Germany is complicated. Guns have to pass an inspection and, should it fail, the gun is confiscated never to be returned. For that reason, it's best to buy a pre-approved gun here in Germany and, of course, they're not cheap. 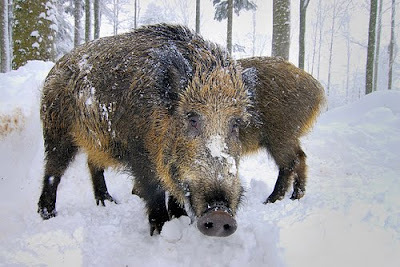 Wild boar in Germany are quite a nuisance. They can travel 20-30 kilometers a night tearing down fences and uprooting crops. Over a half million of them a taken by hunters each year in Germany. Once a hunter is allowed to keep the meat or a trophy of an animal that he's shot it's not a simple matter of just cleaning it and taking it home. He has to register the kill and then pay a fee for whatever he keeps. Of course, the more the trophy is desired and the better quality of the meat and the amount will dictate the cost. For a single animal that can run into several hundreds or thousands of Euros. Well, that's about all I know about hunting in Germany and maybe a lot more than you wanted to know. But I found all this quite interesting and a great illustration of how some things are done quite differently here in Germany.